New Multitudes arises from a distinctly unusual multi-faceted collaboration. The initial entry in the centennial celebration of Woody Guthrie's birthday began as a Gob Iron project helmed, as was Death Songs for The Living (Transmit Sound/Legacy Recordings, 2006) by Jay Farrar and Anders Parker. Given access to the Guthrie archives by Woody's daughter Nora, the duo began marrying original music to selected lyrics of the iconic folksinger from which point the project broadened into what became the New Multitudes project including Jim James, nee Yim Yames, of My Morning Jacket and Will Johnson of Centromatic and Monsters of Folk. The deluxe edition of that album contains a second cd that, short as it is, with a playing time of just over thirty minutes, nevertheless holds its own weight in proportion to the main production. It works as both the Gob Iron sequel and an adjunct to New Multitudes, in part because the packaging of the double cd-set extends the graphics in proportion to the extra music. 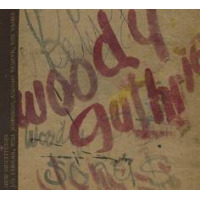 Enclosed in the same earth tones as the streamlined set, the lyrics, in both printed form and reproduced in Woody's own handwriting, are interspersed with the man's own artwork. Thus, the item morphs from a piece of product, singular as it may be, into a unique item worth owning as a piece of history on its own terms. Great albums such as New Multitudes pivot on a self-created circular logic, a motif apparent here in this track's connection to the very first cut on the main cd, "Hoping Machine." The judicious use of familiar production tools such as echo deepen the ghostly air there is representative of the discipline within all this spare, no frills music. Evocative melodies invoke the very desire for something better, which in turn enlivens and enlightens the spirit-and these performances-with a willful optimism so persistent it enters a realm as spiritually tangible as the bittersweet emotionalism of "Careless Reckless Love." Sacrilegious as it may sound, then, New Multitudes' original music is arguably as memorable as the words of Woody Guthrie that lent inspiration to its creation. Thus, while "Old LA" carries some of the same edgy guitar textures that appear elsewhere on the album, the clarity of Parker's voice, especially as it meshes with his comrades,' furthers its resonance beyond this individual track, all the way heart of the project. Radiating clarity of thought and emotion throughout that is emblematic of all great music, New Multitudes also reaffirms the timelessness of the modern folk genre upon which Woody Guthrie was so influential. Track Listing: CD 1: Hoping Machine; Fly High; My Revolutionary Mind; VD City; Old L.A.; Talking Empty Bed Blues; Chorine; Careless Reckless Love; Angel’s Blues; No Fear; Changing World; New Multitudes. CD 2: Around New York; Jake Walk Blues; Whereabouts Can I Hide; Old Kokaine; I Was A Goner; San Antone Meat House; Dopefiend Robber; World's On Fire; When I Get Home; Atom Dance; Your Smile Cured Me. Personnel: Jay Farrar: vocals, guitar, harmonica; Will Johnson: vocals, drums, guitar; Anders Parker: vocals, guitar, drums; Yim Yames: vocals, bass, guitar.